Laura spends her days looking at other people's potential calamities. She works in the radiography unit of a small hospital on the Maine coast, bearing constant witness to the fears of patient after frightened patient. In a job where finding nothing is always the best possible outcome, she is well versed in the random injustices of life, a truism that has lately been playing out in her marriage as well. Since being downsized, her husband, Dan, has become withdrawn, his emotional distance gradually corroding their relationship. With a son in college and a daughter soon due to leave home, Laura has begun to fear that the marital sounds of silence will only deepen once the nest is truly empty. When an opportunity arises to attend a weekend medical conference in Boston, Laura jumps at this respite from home. While checking in, she meets a man as gray and uninspired as her drab hotel room. Richard is an outwardly dull, fiftysomething insurance salesman. But during a chance second encounter, Laura discovers him to be surprisingly complex and thoughtful, someone who, like herself, is grappling with the same big questions about decisions made and the human capacity for self-entrapment. As their conversation deepens and begins to veer into shared confessions, the overwhelming sense of personal and intimate connection arises. A transformative love affair begins. But can this potential, much-longed-for happiness be married to their own difficult personal circumstances? Can they upend their lives and embrace that most loaded of words: change? 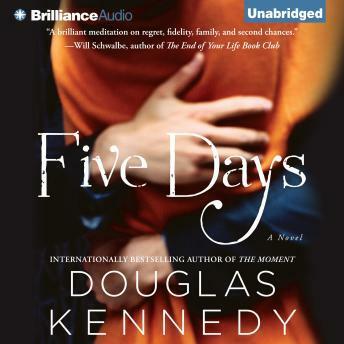 A love story as clear-sighted and ruminative as it is affecting, Five Days will have you reflecting about the choices we all make that shape our destinies. Crafted with Kennedy's trademark evocative prose and pitch-perfect in its depiction of the complex realities of modern life, it is a novel that speaks directly to the many contradictions of the human heart.